An ISU student is on the panel to reveal poverty as a college student! Upcoming programs include: “Affordable Housing: How Do We Get There?” on Tuesday February 26, and “Aging In McLean County,” on Tuesday March 19. All programs are free, begin at 6:30 p.m., and take place in the Community Room of the Normal Public Library. How do we get affordable housing? Bloomington is not only charging for a business license now, they heavily regulate rental property with annual fees: http://www.cityblm.org/government/departments/building-safety/rental-property-program#How%20much%20is%20registration%20and%20how%20long%20is%20the%20registration%20good%20for? Unit 5 just massively raised property taxes. I wonder who the League thinks pays these fees and taxes? The same people pay them as those who pay when corporate taxes are increased: the people using the services or buying the products! A basic economics course should be required before anybody participates in what will likely be a push for government to do something. Maybe ISU should lower tuition so college students aren’t living in poverty while studying to improve themselves. The student loans will further prevent them from prospering after graduation. 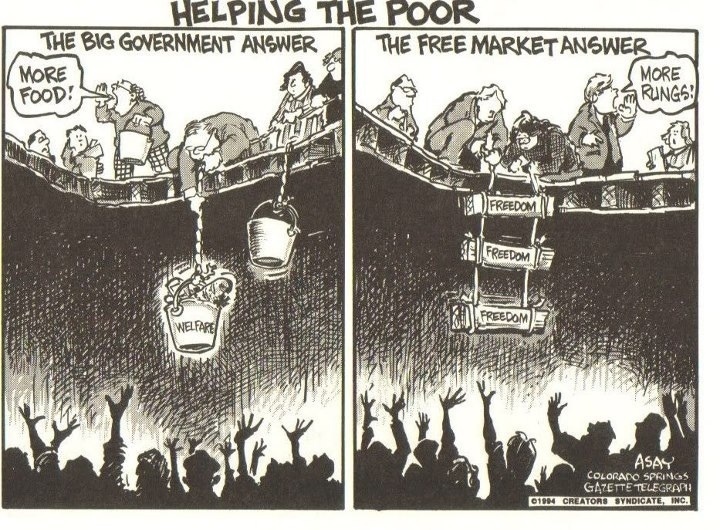 Common thread of poverty: Government intervention in free markets. Posted in BloNo, Bloomington, BLOOMINGTON CITY COUNCIL, elections, Koos, Liberal Media, Local, Normal, Progressives, Renner, Taxes.Tagged Affordable housing, free markets, League of Women Voters, poverty. What is diversification of economic development efforts? Do more across the City! TIF is too specific. ‘Diversification of economic development efforts’ means declaring more minority-and women-led businesses and boondoggles as ‘the right fit’, and further discouraging the largest entrepreneurial demographic, white males, from contributing to the local economy. taking your tax dollars and giving it to the poor. Turn the “Markowitzarena” into mini dorm rooms for ISU students, and use the parking lots across the street for their “green/garden” space! On a serious note! “Affordable housing” How do WE get there, what is this WE. This sounds like liberal speak for I want better living and YOU pay for it. Meanwhile they charge for inspections, raise taxes and spend on “way faring signs” All of which the money COULD go to civic betterment! But THAT”S NOT the democrat way.. They like adversity, theft (of anyone’s money but their own), problem creating-when there ISN’T one and spreading race misunderstanding..
OOPS. It’s almost 12 O’CLOCK. Gotta go watch the start of the downfall of Illinois! The League of Women (Democrat) Voters has been working for several years on their studies of affordable housing. The agenda is obvious to anyone paying attention. These forums are a shame designed to guilt residents into supporting more public housing and attacking “big bad” landlords. ‘Big bad landlords’ should attend and ask them if they will lobby to reduce unnecessary regulations or if they aren’t really serious about helping the problem. I know in some cases you could reduce rent by At Least $25/unit/month ($300/yr) immediately just by tweaking 2 ordinances, and that’s just a low estimate off the top of my head – there’s probably more. POOR ISU students! They can afford booze,fast cars and drugs but need free food(food pantry). If they can afford booze,fast cars and drugs then they are NOT POOR! Subsidized by the taxpayers in the form of student loans. Remember, that money DOES NOT go directly to the school, a kid can use it just as easily for a 3 week Spring romp in Florida. Many of them do.